The two views in these photos show a stretch of river which had been badly poached by cattle leading to the banks being denuded of all vegetation. The result is not just offensive to the eye but has also reduced insect life to the detriment of birds and fish populations. The second photograph shows the same view after the fencing had been erected for only a short period, just a few months. The area protected by the fencing has regrown with a variety of plants providing seed for visiting birds (charms of goldfinches visit regularly) and has begun to provide bankside cover for fish. It is now several years since this work was completed and the effects are even more pronounced. 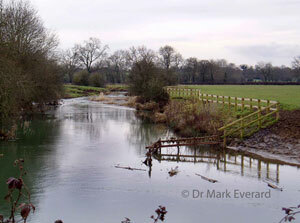 The stretch has now become much more useful to the local angling club who stock trout into it. 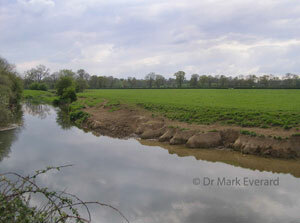 The stretch also produces grayling, dace and roach. This project was completed following advice by Dr Mark Everard and was managed by Dr Sid Jevons on behalf of their local angling club. Funding was kindly provided by the environment agency.